Plain red field with a white star in canton (2:3). Source: Flags of Paradise 1996. [King] Pomare III had introduced on 26th August 1822 a red flag with a white star in the upper hoist which was also used on Bora-Bora, Huahine and Raiatea. This flag was in use until the red-white-red flag of equal stripes was introduced. Sources: The Flag Bulletin III:2, Vexillinfo VII/1982 and a French flag book about Tahiti whose title I no longer remember. Horizontally divided, red-white-red (2:3). Source: Flags of Paradise 1996. As far as I know the flag of Tahiti had equal stripes red-white-red, invented on 17th March 1829 by Commodore J. Laws, made official on 16th September that year. Later flags with French canton had also equal stripes. Sources: The Flag Bulletin III:2, Vexillinfo VII/1982 and a French flag book about Tahiti whose title I no longer remember. Unequal stripes (in the past) were a variant but not wrong. The national flag had equal stripes but the royal family flag had a device in the center, so the white stripe was wider. People used that flag too, leaving out the royal device. Queen Pomare's flag was red with a white star in the centre, above it a yellow crown within a green garland. Sources: The Flag Bulletin III:2, Vexillinfo VII/1982 and a French flag book about Tahiti whose title I no longer remember. The Royal device was not like the green wreath-like device which appears on this scan from Saquet 1998. The flag had red-white-red, 1+2+1 stripes and had a large wreath of two palm leaves which were crossed at the bottom similar to the illustration on that scan, i.e. not as usually one to the hoist and the other to the fly, but with both ends to the hoist. This wreath overlapped onto the red stripes. Within the wreath nearly touching the upper red stripe was a golden crown. This was the Royal flag, possibly used at sea, as it is labelled Pavillon royal tahitien. It was in use around 1843. A later flag showed a similar device but with the words VICTORIA EX POMARE (Victory from or out of Pomare) surrounding the slightly different wreath at the bottom (exactly running from 10 o'clock to 2 o'clock), the EX completely within the bottom red stripe. As the flag was in use from 8th January until 24th December 1846 I assume it was a war flag. From February 1844 until December 1846 there was a civil war. Horizontally divided, red-white-red, with French tricolour in canton, white fimbriation when needed (2:3). Source: Flags of Paradise 1996. 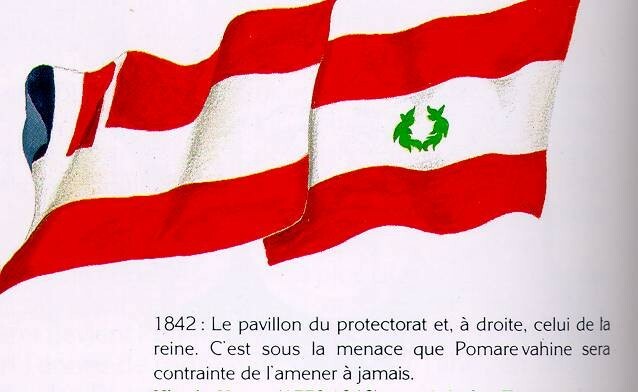 Saquet 1998 says about this flag, 1842: The flag of the protectorate and, on the right, the one of the queen. Pomare vahine was bullied into taking it for ever. See this scan. Horizontally divided, red-white-red, with French tricolour in canton, without fimbriation (2:3). Source: Flags of Paradise 1996. Like [pf-tah18] already in FOTW, similar to [pf-tah45] but with proportion 1:2; Meyers Konversations Lexicon (1897) missed the 1880 change (the flag disappeared after annexion). The red-white-red equal stripes flag was used until 1880 (since 1842 with French canton, several official modifications), when Tahiti became a French colony. Norie and Hobbs 1848 (and also Steenbergen, Vlaggen van aller Natien, 1862) includes an Otahiete flag with three horizontal stripes (1+1+1) of red, yellow, white with a yellow sunshine in upper hoist on the red stripe. Proportions 2:3. Is Otahiete an old name of Tahiti? According to Encyclopaedia Britannica, Otahiete is indeed an old variant name of Tahiti. Otahiete is Tahiti, and the flag is the one of a rival government to the local government. The sunshine is a compass.